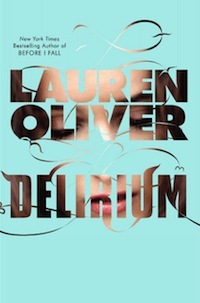 Today is the release day of Lauren Oliver's (Before I Fall ) second novel, Delirium ! Lena has waited almost her entire life for the day when she will turn eighteen and can finally have the cure, the procedure which will take away that horrible, horrible disease amor deliria nervosa--or, love. Everyone tells her that being without love is so much easier, and she'll be much happier, and Lena readily believes them, not wanting to be like her mother, who resisted the cure and eventually committed suicide, causing her to become a social outcast in her community. But her entire life changes the summer before her procedure takes place when she meets Alex. He's sweet and kind, and oddly mysterious. He makes Lena feel things she can't name, things that she knows are dangerous. And before she can realize it, she's fallen in love. Like with her debut, Before I Fall, Lauren Oliver wields a mesmerizing power over her readers in her latest book. Delirium and the world it is set in is fascinating--it's much like our own, only with the absence of love people are controlled by the government in being told who they must marry, and are kept in a caste-like social system to keep order, but really everyone's lives are empty and meaningless without the love needed to generate all of the passionate emotions and bring about change. Instead, that is left to the younger generations without the cure, like Lena. As she fumbles through life, acting on impulses she can't understand that the reader knows to be love, Lena slowly begins to recognize and fully comprehend what exactly love is—romantic, familial, and platonic—and how very essential it is to life. The majority of the book isn't necessarily about her romance with Alex or a revolution in thinking, but about Lena's journey toward acceptance of love and knowing that life is meaningless without it. In the process, she comes to understand her mother and her motivations, and uncovers some startling and ugly secrets. Oliver wraps up the novel with a joyful, gut-wrenching, bittersweet conclusion that is just open enough for the possibility of a sequel, but more importantly emphasizes the power of love and makes you carefully consider what most of us take for granted. Once again, Oliver has written tremendous, intoxicating book readers will devour. Cover Comments: I like the light blue of the cover a lot, and how the title and author's name are formed from the cut-out with the girl in the background. It's such a neat effect! Sounds pretty interesting! I agree with your assessment of the cover...it's quite attractive. I just ordered this book online and I'm super excited to read it! Her first novel had such a big affect on me. I just hope this next book is as good as Before I Fall! The review for this book was so difficult for me to write...nothing I said could describe how much I loved it! I did expect it to have a lot of introductions and explanations since it's a dystopia and the first of a series. This might bore some people.For me on the other hand,I couldn't put it down.It's very different from what else l have read but it seems to be quite popular with books coming out where society controls love.